It will soon be time for the third School peripheries call for proposals, with the aim of carrying out a collaborative art and education project in school, neighbourhood or city spaces. Therefore, we think it is a good time to get together, share the projects and the experiences from the 2016-2017 academic year and open up possibilities for next year. In this meeting we will talk about artistic productions, education and collaborative projects, and we will create an environment in which to air our ideas, doubts and proposals. 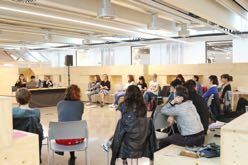 The session will take place in Tabakalera, on 11 May from 17:00 to 20:00, and is open to anyone working in the field of education. 17:00 → Presentation: School Peripheries. Tabakalera Mediation Team. 19:00 → Sharing the needs of schools. Presentation: Herri Eskola (Elgoibar) and Arizmendi ikastola (Mondragon) + Space for dialogue and collective reflection.